Green T. House is a restaurant in Beijing. We went there near the end of our trip to China, but I have not gotten around to blogging about it. Until now, that is. This restaurant is spectacular. It is probably the most beautiful restaurant I’ve ever been to. We have a few pictures on Flickr, but they don’t do it justice, because of the lighting for the most part. 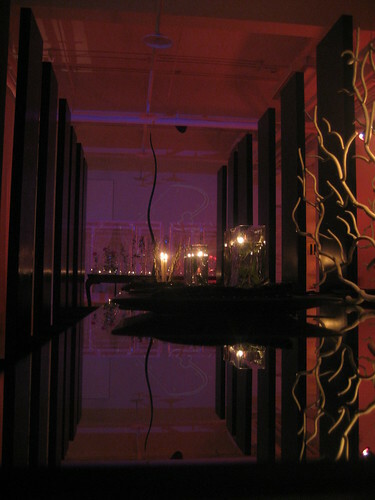 The restaurant is like a post-modern version of Alice in Wonderland. It was a visual and auditory heaven. I wish I could have the same decor here at home. The theme, as you might have guessed, is tea. Many of the dishes involve tea, in various shapes and forms. Parts of the menu are given out as white-out on big tea leaves, which is cool. The food is delicious and service superb, as one might expect. The prices are very high: this is an expensive place, even by European standards. However, it’s well worth it. We were there on a quiet night, with only a couple of other couples around. There was Asian-style belly-dancing entertainment in the middle of the meal, out of nowhere. This was by far my favorite restaurant of the trip, and by definition, my favorite restaurant in Asia, to date 😉 If you’re ever in Beijing, you should go there.